Sometimes I make a quilt and have to wait a bit of time to share it with you, due to publication schedules. Well, when I went on my computer to grab the photos for this post, I noticed they were taken almost a year ago to the day. It's been a long wait! I'm pretty happy to share this quilt with you though, named Holland Mills, as I just found out it's on the cover of Australians Quilter's Companion's new magazine, Quilts for Today. 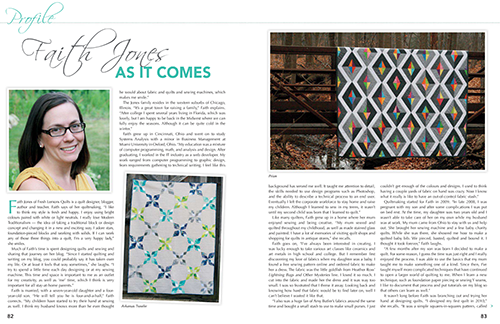 When I first designed this quilt, I knew I wanted to use fabric from Bonnie & Camille's Happy Go Lucky collection. I used those colors as my base and added in a few coordinating prints outside the collection. I just love these colors! 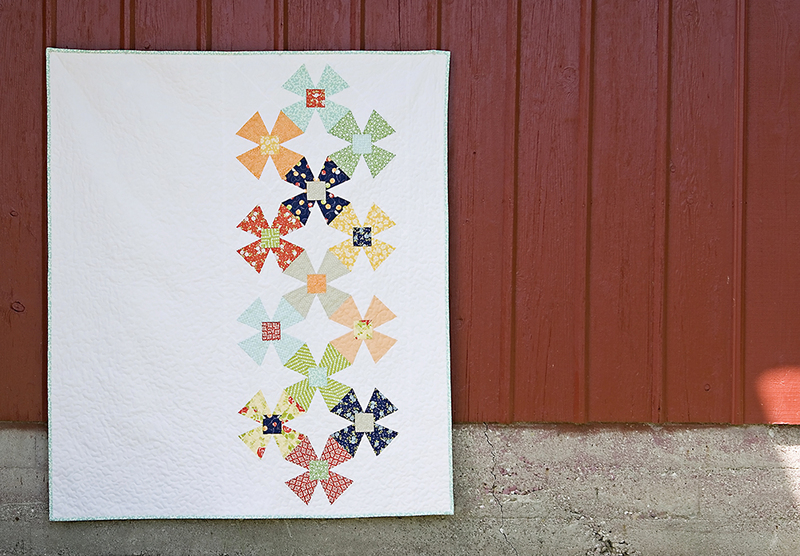 This quilt pattern uses paper pieced blocks placed on point and off centered. The finished quilt is 60" x 70". The backing is a beautiful yellow floral stripe, also from Happy Go Lucky. I kind of joke that this sort of design is great for when you want to make a quilt, but don't want to make 100 blocks. :) But you can also have a lot of fun with the negative space. The background fabric would look awesome as a dark solid, or how about a tiny dot? If you are super lucky and live in Australia, I believe this magazine is just arriving in shops. If you happen to live elsewhere and are interested in the magazine, you can buy a digital version online here (which I just tested out and was very easy). Oh, and there's even a little profile article about me in the magazine...if anyone is interested in that sort of thing (like my mom - ha). I hope you will check out the new magazine though, it's full of great patterns and profiles!